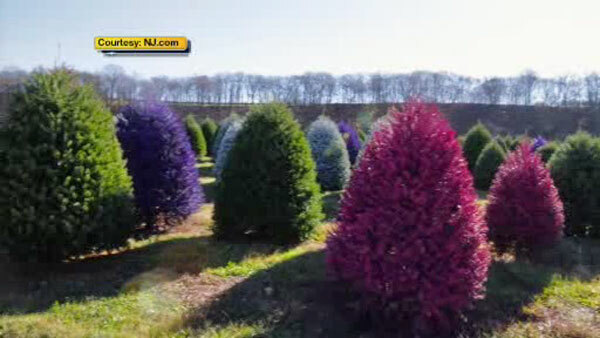 BELVIDERE, New Jersey -- Green Christmas trees are apparently so last year. This holiday season it's all about a tree of a different color. That is at least according to the folks at Wyckoff's Christmas Tree Farm in Belvidere, New Jersey. Purple, silver, hot pink, light blue, electric blue - the colorful tree of your sugarplum dreams is now a reality. These trees may not look real, but they are! "They definitely have a smell, Christmas tree scent and Douglas fir hold needles very well," said farm owner, John Wyckoff. It's a latex based paint that's fire proof. Last weekend, the trees were so popular - they sold out.